The humble hoe is a beautifully simple but deceptively versatile garden tool. Above all it allows you to remove small weeds from around plants without having to bend or kneel, but hoeing also vitally serves to open up and aerate the soil. Some hoes can be used for forming seed drills in the vegetable plot or when sowing annuals directly into the garden, others for drawing up the soil around plants. Most have in common the long handle that minimises effort and allows you to reach deep into beds without trampling plants or compacting the soil. The ‘draw’ hoe has its metal plate at right angles to the handle and is pulled towards you, chopping underneath the weed seeds. Its takes more effort than other hoes, but the corner of the blade can form seed drills. For drawing up earth around potatoes or making small furrows for planting onions and garlic it is invaluable. Some draw hoes have prongs at the opposite side of the blade so that you can turn it upside down and use the prongs for making seed drills or breaking up the soil. The ‘scuffle’ hoe, shaped like a stirrup, has a sharp blade that lies flat on the soil and allows you to both push and pull around plants to get rid of weeds. A recent addition to the world of hoes is the ‘swoe’, which has a triangular blade, sharpened on each edge. With the swoe you can push under weeds, draw them up towards you, make drills and even get in behind plants without damaging them. The swoe is one of the few ‘new’ gardening tools to have caught on and is popular with many gardeners. As with most gardening tools, you quickly find your favourites and remain loyal to them, and after years of gardening with Dutch hoes, I find the swoe difficult to use. 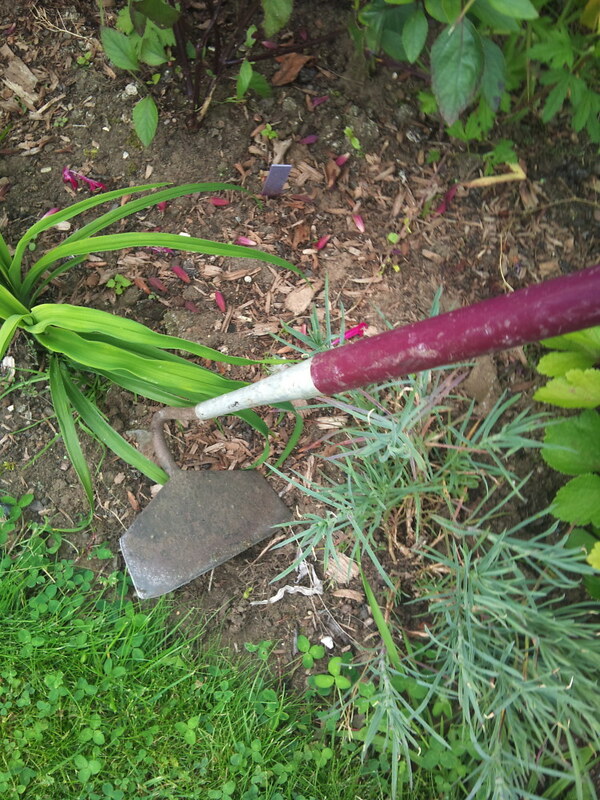 For working on raised beds or for getting down on your hands and knees to work between closely-grown plants where a long-handled hoe might cause damage use an onion hoe. This is a short-handled version of the draw hoe, traditionally used for weeding between onions. When buying a hoe check that the blade has been forged, which means that it is made from the same piece of metal as the handle attachment. This gives a strong, long-lasting tool. Welded hoes are much cheaper but much weaker and at some point will break. Unless the blade is stainless steel, you can keep it cutting efficiently by occasionally sharpening the edge of the blade with a smooth metal file.